Holotype specimen of Tokummia katalepsis, before preparation. Expectedly, things had changed when we discovered Marble Canyon a hundred and three years later, about forty kilometres to the south of today’s Walcott Quarry. They had changed in a way that increasing scepticism—that wayward wind pushing the scientific galley—had been cast on the systematic value of the morphological characters that, to Walcott, had looked convincingly crustacean in nature. Without diagnostic elements of the head anatomy, other body traits had been considered ancestral or convergent, or shown to differ in fact from the originally assumed morphology, such as the phyllopod-like limbs themselves (which, as their name indicates, bear leaf-like inner and outer branches in two separate groups of the traditional—but paraphyletic—“Crustacea”). Such questioning had taken two distinct forms, however. In a first redescriptive effort, and somewhat in the inertia of his mentor Harry Whittington, Derek Briggs had put forward the inconsistencies between the available evidence provided by these bivalved fossils and the expectations of a carcinologist. This had led to heterogeneous conclusions regarding the affinities of these animals. Epilogues heterogeneous, or chimeric, as the fossils themselves—their bodies were crustacean enough, but their heads… their heads, for all the skills in understanding fossil preservation, for all the patience to prepare the specimens, made these arthropods Sphinges and Lamassus. It was at that time that Briggs had put his finger on the key character that would have had made these species step into the “modern pool”: the mandibles. He had thought—albeit prudently—to have found them in Canadaspis, but on a single and arguably difficult-to-interpret, dorso-ventrally preserved specimen, such that the argument had not stood the judgement of all his peers over time. 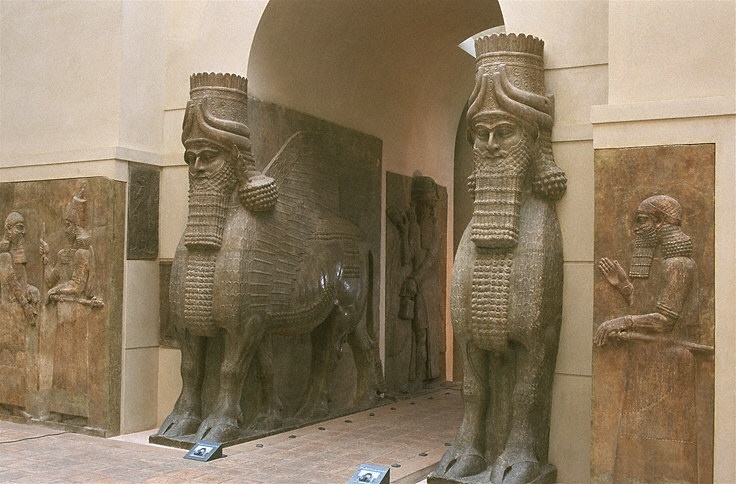 Lamassu(s): Assyrian chimeras and guardians of cities. Bivalved arthropods were guarding their secret just as monumentally. Indeed, two decades later, Graham Budd had converted the reserve that Derek Briggs had showed with the interpretation of these anomalous heads into an audacious attempt to integrate that unwieldy evidence within a possible resolution of head appendage homology across arthropods. This had set a new heading for the bivalved “phyllopod crustaceans” of the Cambrian, which, instead, were to become candidates for the origin of the “true” arthropod body plan, the one built on both segmented appendages and segmented body (diagnostic of “euarthropods”). Thus, a shift had occurred from a cautious reading of fossil material introducing new challenges in crustacean macroevolution to a forefront staging of the strictly available data in an all-out performance replaying the euarthropod story from the start. The following years had then seen the rise in strength of the Mandibulata hypothesis, unifying all euarthropods with mandibles, as well as that of the Tetraconata or Pancrustacea concept, considering hexapods (i.e. insects, springtails and their close relatives) as derived crustaceans. And so, if the iconic bivalved arthropods from the Burgess Shale had been telling us about the origin of crustaceans, what and where were the first mandibulates? For some, it had become even more compelling that these species had to have been very distant from extant clades, even if there were very few, if any, morphological characters in the immediate euarthropod outgroup (the relatives of Anomalocaris and other arthropods with soft, unsegmented body cuticles) that “anchored” bivalved arthropods at the base of the phylogenetic tree (other bivalved Cambrian arthropods, the isoxyids, likely occupy this position, but have a very different anatomy). Paratype specimen of Tokummia, showing labral complex, antennules and maxillipedes at the front. Note whiter ridges around certain fossil features: those are preparation marks. Only two specimens of Tokummia were found during the first field season at Marble Canyon in 2012: a carapace with the frontal chelae but little of the rest of the body, and an isolated pair of those moulted claws. An affinity with Branchiocaris was already inviting, but the animal remained too enigmatic to draw far-reaching conclusions, and it was initially planned to publish it alongside Surusicaris (an isoxyid). But then came the ambitious 2014 expedition, during which a larger and more intense quarrying of the fossil site started—and Tokummia revealed itself as a highlight of the “big arthropods,” next to Yawunik and Sidneyia. Not only was Tokummia abundant, especially within the “fat beds” corresponding to the densest mudslide events, but the specimens were of singularly arousing beauty, triggering a volley of colourful onomatopoeias every time a large slab was split open. A month and a half of work provided us with enough specimens to become much better acquainted with the shielded predator and its “can opener” type of pincers. It was therefore decided with Jean-Bernard Caron in the aftermath of that field work, surrounded by the flirting lovers of the Plaza Independencia in Mendoza, that Tokummia had to follow its own bumpy road to immortality. Plaza Independencia, Mendoza, Argentina. Where lovers meet and papers split. Having beautifully-preserved specimens was not all, however—even if this had already come as a result of sustained physical effort and financial input. 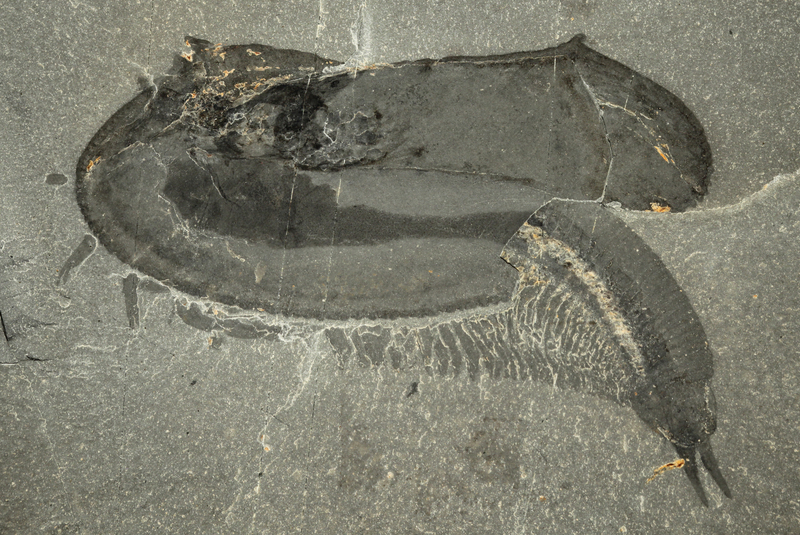 Although compressed into thin layers, Burgess Shale-type fossils usually retain three-dimensionality, implying that the mechanical removal of certain protruding features can reveal parts of the anatomy above or below, depending on the orientation of the specimen. Such type of preparation has been widely used for Burgess Shale animals, but for those that are covered by broad carapaces, it can mean a great deal between knowing the form or knowing the content. This is when something like a palaeontological version of Groundhog Day began, in which Jean-Bernard would call me over day after day following new preparation of the holotype and we would find ourselves shaken and sparked by the new implications of the palaeontological dissection. Every day seemed like reconstructing the entire rationale underlying the significance of Tokummia, but each time with the same wholesomeness of scope. The instability of that early tower-building phase of research was in fact caused by a rather recurrent limitation across compressed arthropod fossils: uncertainty of the proximal morphology of appendages and order of appendage insertion, especially of those in the head. The holotype, laterally preserved, had outstandingly revealed, after preparation, the alignment and number of trunk appendages, but the key evidence of head appendage arrangement was still lacking a decisive blow of the hammer—in that regard, we were still in Briggs’ shoes. 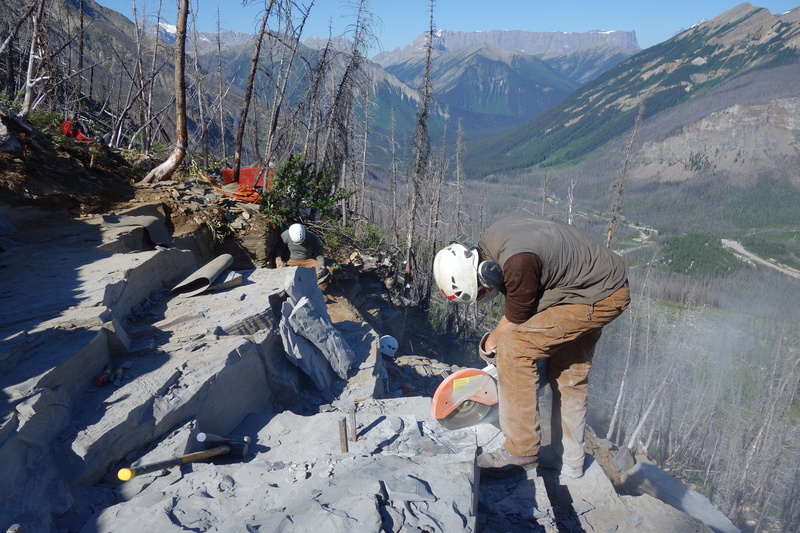 Yours truly cutting beautiful light-blue shale at Marble Canyon, in front of the dramatic sceneries of the Canadian Rockies. This is where Tokummia specimens are resting, claws out in the expectation of being discovered. And then, rather providentially, an additional specimen was found by Joe Moysiuk as he was helping to further prepare a large slab brought back from the Rocky Mountains. This one individual was but a moult, with partially disarticulated cuticular pieces, which required some more careful preparation to separate part and counterpart. Admittedly unimpressed from afar, as this looked merely as just a pair of valves enclosed on an unfortunate jumble (badly preserved specimens do occur in the Burgess Shale too...), my state of mind changed as I looked through the binocular: that carcass had rows of endites at the base of its limbs! It may not speak to the imagination as much as “this exoplanet had liquid water!” or “this stem cell line grew a new heart!”, but, in the forest of science, it had the effect of a switch illuminating a network of fairy lights on the tree of arthropods. 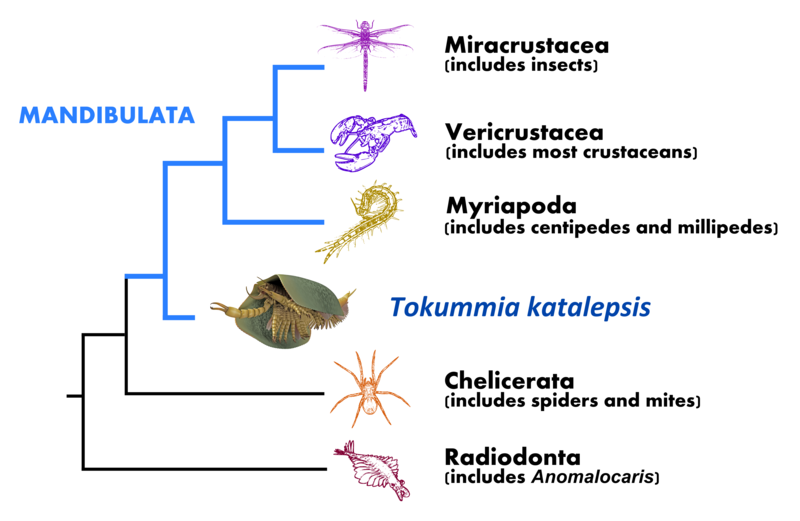 Simplified phylogenetic tree showing Tokummia at the base of mandibulates, accompanied in fact by other bivalved species from the Cambrian. The fossil arthropods called euthycarcinoids and fuxianhuiids, not shown here, would constitute the stem of mandibulates. This set of events has also implications beyond the natural history and evolution of arthropods. 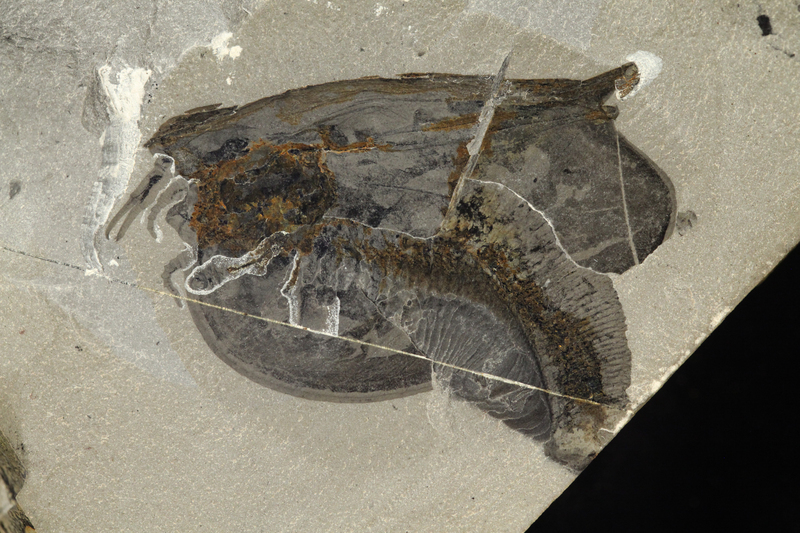 The story of the bivalved arthropods of the Burgess Shale serves also as a canvas of reflection upon one of the bêtes noires of palaeontology: the absence of evidence taken as evidence of absence. In cases such as this one, the “evidence of absence” (that is, heads with only one or two pairs of appendages and no mandibles) had been chosen as a proactive epistemological move to test the impact of the available evidence in its standing shape, as opposed to a more prudent and conservative approach that might have held onto hopes and assumptions perhaps in need of deconstruction. It was certainly not unjustified, but it should also come to no surprise that such evidence was in fact initially just unknown or inaccessible, and therefore that our understanding was incomplete. It illustrates also that, ironically, a positive interpretation of incompleteness can sometimes take us much further away from the original evidence than the cautious or eventually complete views. The lesson may be that absence of evidence should be followed to the letter, but in a varied and imperfect world, where exactly should we draw the line? The problem concerns fossil material in general, of course, but it is also possible that Lagerstätten are more prone to the effect of inflating the absence of features, since the quality of preservation tend to make us more confident about what is present and what is not. Still, in Cambrian animals, with such deviations from extant body plans, how can we consider evidence to be missing if we have no particular expectations? Holotype of Tokummia katalepsis, after preparation. 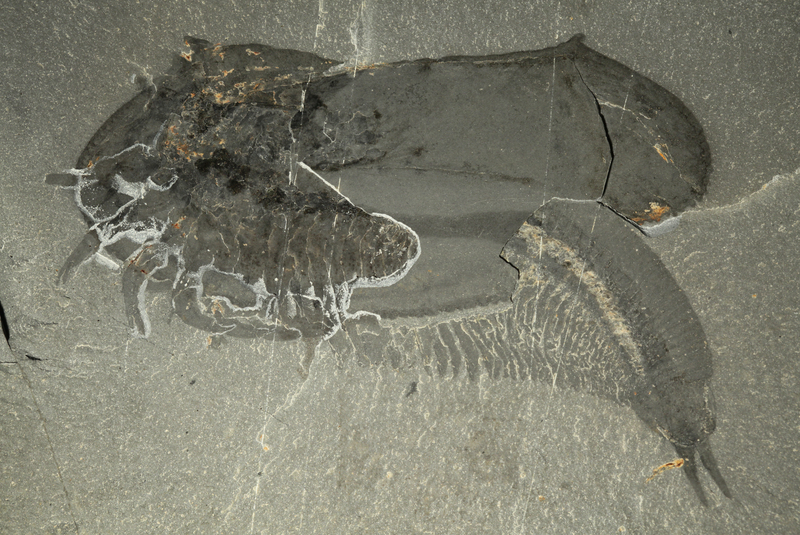 That critical features such as mandibles in the Burgess Shale have, if not totally escaped, at least evaded common preservation and clear identification, with dramatic consequences for the understanding of fossils and for whole phylogenetic trees, shows not only that there is still much to the morphology of species already described, but also that the supposed absence of just one of these features might make such species largely misunderstood. If not echoing traditional views so much itself, Tokummia might boldly ask: How many Cambrian stories still have to be rewritten?